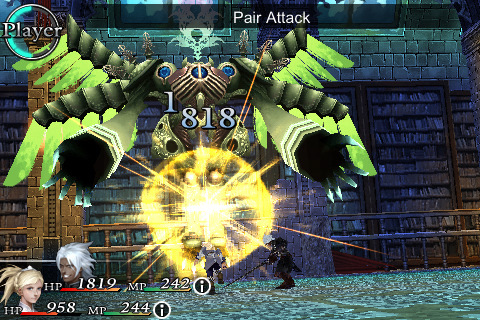 CHAOS RINGS is what happens when developers with deep pockets start taking the iPhone seriously as a gaming platform. This is decidedly a gamer’s game. Square Enix wasn’t messing around when they committed to this project and delivered a fully fleshed out and functional action RPG, more heavy on the combat side but also complete with highly convoluted story telling. This is about as close to an original FF game for the iPhone as you can get. To start out, you have your choice of two character pairs to play as, some more obnoxious than others, but with way more personality than the usual Final Fantasy fare. Each set of characters has its own particular story line, and I won’t spoil you with their overly complicated backstories, but just know that they’ve been dropped into a mysterious arena where they’re forced to fight for their lives. Gameplay is effectively a dungeon crawl with turn-based combat. It’s pretty standard stuff, but issuing individual commands to your two party members invites a little more strategic planning than simply rushing in to attack. One detail I was super-excited to uncover was the option to turn off random encounters. This messes a little with the classic grinding model, but does loads for the pick-up-and-playability. 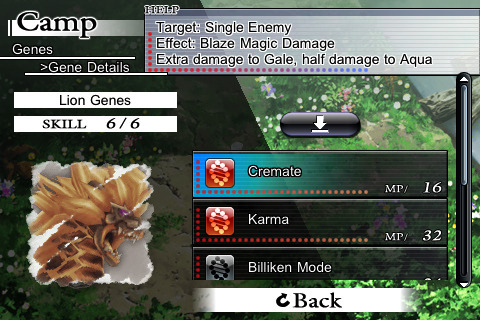 Over time, you can customize your characters with “Gene Plates” that you pick up from defeated monsters. The Plates all have various abilities and spells which are unlocked by defeating monsters of the same Plate-type. In general, the magic is really kind of disappointing, but mastering the Plates does result in a pretty sick set of skills that leave you blazing through enemy encounters as a whirlwind of destruction. Unfortunately, this does make the game feel a little too easy, and the further in you get, the less challenging it becomes. There’s definitely the primal thrill of utterly destroying an enemy, but even that goes away after awhile. Another minor disappointment were the puzzles. 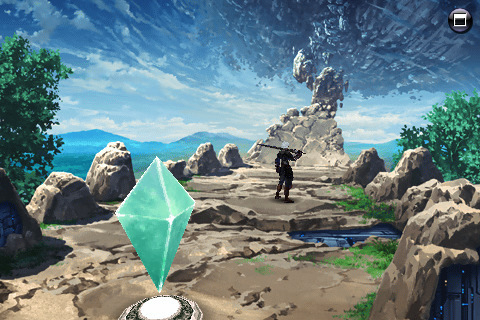 They have you moving blocks and collecting crystals through the stages, which teleports you around the map. These are seriously annoying to navigate and felt tacked on at the last second. One of my colleagues complained elsewhere on the site that Square Enix spends all its time making things look pretty, and in the case of CHAOS RINGS, it’s clear they definitely spent a lot of effort making the visuals shine, but it is so totally worth it. It looks like a throwback to their classic Playstation days, and character designs and environments carry the signature polish of any Final Fantasy game. CHAOS RINGS is not a perfect game, but it is deeper, richer, and more engaging than just about anything you will find in the App Store. I’ve been playing it for a week and haven’t come near to finishing it all. It’s also loads more affordable than the latest FF title, especially with the current sale price of $9.99, to celebrate its release on the iPad. Now, this may still sound like a lot by app standards, but when you consider that you are getting a full, original JRPG that can stand up to just about anything on PS3 or X-Box, it’s quite honestly a steal, a beautiful, beautiful, action-packed steal. AppSafari review of CHAOS RINGS was written by Tracy Yonemoto on September 15th, 2010 and categorized under Action, Adventure, App Store, Fun, Games, Puzzler, RPG. Page viewed 4208 times, 4 so far today. Need help on using these apps? Please read the Help Page.